I then decided that travel-tales.org should be about travels and stopped updating you on my progress in the world of fashion. That does not mean my progress stopped, I just stopped telling you about it. Please excuse this dart back into fashion, I wanted to share my recent soft-launch of a couple of businesses from my home in Berkshire in the UK. The brand I consider my principal one is bakuba, under which I make women’s business clothes sized for bust and hip to waist ratio. The idea for this has been brewing for quite some time. During my pre-fashion career I always struggled to find business clothes that fit properly. Women are all shapes and sizes and rarely do bust, waist, hip and torso length consistently match the size of any one top or skirt. Most clothes are made for women who are a B/C cup. Anyone larger than that has become used to buying clothes a size or so up which are then baggy pretty much everywhere else, those smaller than that have got used to looking a little empty in places. If, like me, you don’t have much of a waist you find clothes that fit around the hip and dig in at the waist, or that fit around the waist and baggy around the hips. Until now, the alternative to poorly fitting clothes from the high street has been custom tailoring. This is very expensive and time consuming for both the tailor and the client. Measurements need to be taken, fittings are scheduled and adjustments need to be made to get that perfect fit. Rarely do people with money have time (and vice versa). I felt there must be a middle ground, where particular common poor fit challenges, like a bigger (or smaller) bust, a non-standard hip/waist ratio or a long/short torso can be addressed. The idea for bakuba was born and I hope to meet that need for women across the EU (I haven’t investigated customs rules for export beyond the EU). The picture above is of my current designs. When ordering you let me know your bra size and waist for a top or a few different measurements for a skirt. 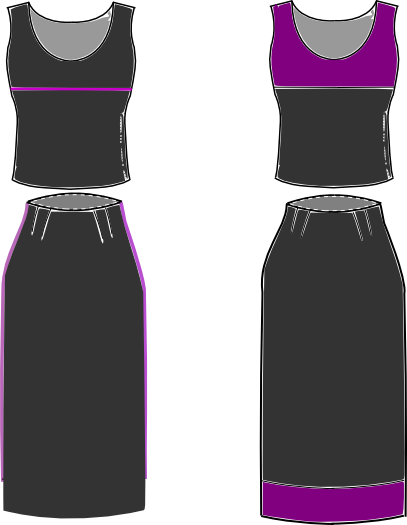 You can choose from a palette of seven colours and I then make your garment to your specifications. Lastly, one project at a time, I take on commissions under the Lingard Gardiner brand for custom design and tailoring. I am currently working with a bride on her wedding dress so will not be taking on custom orders until after her wedding. There are more travel tales on the way as usual every Wednesday!